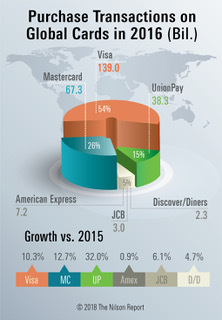 UnionPay cards had the largest percentage increase in purchase transactions. Combined, UnionPay credit and debit card purchase transactions at merchants grew by 32.0% in 2016. The total volume of consumer and commercial purchases at merchants added to cash advances and withdrawals obtained using credit and debit cards reached $26.044 trillion last year, up 6.4% — $1.560 trillion more than in 2015. Mastercard and Visa cards combined generated 57.41% of total volume, up from 56.55%. UnionPay debit cards accounted for more total volume last year than any product from the other brands with $6.416 trillion. However, some of these UnionPay cards are used for consumer and commercial real estate and other large-volume transactions as well as for purchases on online wholesale marketplaces. Purchase volume for goods and services, which excludes cash advances on credit cards and cash withdrawals on debit cards, was $20.606 trillion, up 5.8% over 2015. Mastercard and Visa cards combined generated $52 of every $100 in purchase volume in 2016 compared to $50 in 2015. UnionPay cards generated $41 of every $100, down from $43. Visa cards accounted for $35 of every $100, up from $34. Mastercard generated $17 of every $100, the same as in 2015. Debit cards generated 47.38% of Visa’s purchase volume, up from 46.63% in 2015. Debit cards generated 33.15% of Mastercard’s purchase volume, up from 33.07%. UnionPay debit cards generated 62.48% of its purchase volume, down from 63.79%. When comparing credit card purchase volume only, Visa’s market share of 35.24% was up 54 basis points. UnionPay’s share declined by 5 basis points to 29.74%. MasterCard’s share increased 12 basis points to 21.91%. American Express’s share dropped 53 basis points to 9.55%. JCB’s share slipped 4 basis points to 2.18%, and Diners Club/Discover’s share fell 4 basis points to 1.39%. When comparing debit card purchase volume, UnionPay’s share declined 233 basis points, but its 53.77% share topped Visa and Mastercard combined. Visa’s share increased 204 basis points to 34.44%, and Mastercard’s share increased 29 basis points to 11.79%. Cash advances against lines of credit and cash withdrawals from funds on deposit combined increased by $425.81 billion in 2016 and increased as a percent of total volume to 20.88% from 20.47%. For Visa, cash accounted for 29.07% of total volume, down from 30.60%. For Mastercard, cash accounted for 27.20%, up from 25.95%. For UnionPay, cash accounted for 11.90%, up from 10.29%. For Diners Club/Discover, cash accounted for 7.60%, up from 6.96%. For JCB, cash accounted for 2.99%, down from 3.20%. For American Express, cash accounted for 1.32%, down from 1.38%. Debit cards accounted for 92.41% of the UnionPay card base, up from 92.06%. For Visa, 67.36% of its cards were debit, up from 66.25%. For Mastercard, 53.20% of its cards were debit, up from 50.33%. Visa, Mastercard, American Express, and Discover brand credit cards issued in the U.S. generated 47.95% of global credit card purchase volume, up from 47.59% in 2015. For Visa, the percent change in credit card purchase volume was greater on cards issued inside the U.S. (up 15.3%) than those issued outside the U.S. (up 3.9%). The number of Visa credit card purchase transactions increased by 2.81 billion inside the U.S. compared to a 1.17 billion increase outside the U.S.
For Mastercard, the percent change in credit card purchase volume was greater on cards issued outside the U.S. (up 7.6%) than those issued inside the U.S. (up 6.2%). The number of Mastercard credit card purchase transactions increased by 2.64 billion outside the U.S. compared to a 0.60 billion increase inside the U.S.
For American Express, the percent change in credit card purchase volume was greater on cards issued outside the U.S. (up 10.8%) than on those issued inside the U.S. (down 3.0%). The number of American Express credit card purchase transactions increased by 0.27 billion outside the U.S. compared to a 0.20 billion decline inside the U.S.